Can Spawnsire of Ulamog cast cards outside of your commanders color identity? 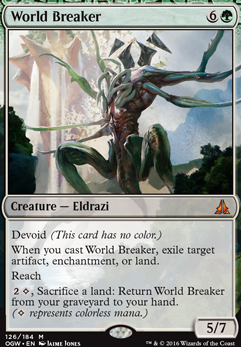 World Breaker would be really good with Cloudstone and Statue for permanent removal of pesky artifacts, lands or enchantments. Platinum Angel can work to lock some combos out. Rune-Scarred Demon or for answers can be good. 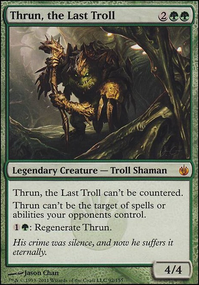 World Breaker sees play in green tron for a reason- a universal exile is pretty decent. The best in my opinion? Protean Hulk - The combos are all out there and your spells have its sacrifice as a casting cost. I'd give some thought to Distended Mindbender sideboard- its not perfect but it works wonders against control. Its also worth looking at Extractor Demon - the ability to cast it from the yard then sac it is pretty decent. Hey, $200 is still budget :) Some Commander decks are thousands of dollars. For the manabase I think there's too many Islands. 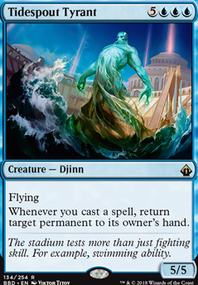 You want a lot more green than blue because green cards (land ramp spells) are more important to be able to cast in the early game and they can search for a blue source. 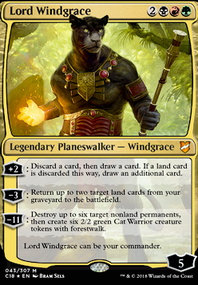 Tatyova and the landfall strategy requires a lot of lands; don't be bashful in the amount you play, more the better in my opinion. To be useful cards like Burgeoning, Cobra, the Scouts, Gardener, Ranger and Atlas need a lot of lands. Khalni Garden is not worth what it does because it ETB tapped. Consider cutting it for another Forest? You have a Breeding Pool which is great, consider Nature's Lore ? This two drop land ramp spell lets you search for and put Pool onto the battlefield. Kodama's Reach is another Cultivate. Consider Sylvan Scrying and Crop Rotation ? 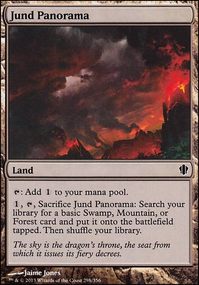 These cards aren't land ramp, instead they can tutor for Reliquary Tower or a Fetch land and these are pretty important lands to have on the battlefield with Tatyova. 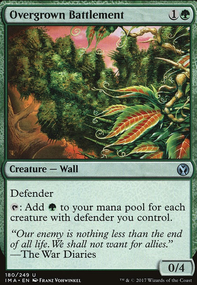 There's no creature tutors here and that could a problem if you get overwhelmed with land support cards and not something bigger to take advantage. Consider Fierce Empath and Fauna Shaman ? 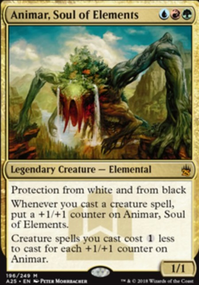 Empath can tutor for a big finisher landfall creature such as Avenger or Rampaging. Fauna can be a repeatable creature tutor by discarding a dork to then tutor for any other creature. She can tutor for a big creature or a support creature like Excavator, Witness, etc. Helpful to have when you can't play a lot of expensive price creature tutors. Nissa, Vital Force : her ultimate can happen fast and it's a source of draw playing lands that your opponents can't stop (emblem). World Breaker : supercharged Acidic Slime who you can recur. Scavenging Ooze : repeatable graveyard hate is very helpful in multiplayer Commander. Mana Breach : good with Tatyova/landfall, disrupts your opponents much more than you. Arcane Denial : sometimes you need a two drop counterspell and Denial is only one blue mana hard counter. Mystic Remora : one of the best sources of repeatable no mana cost draw in multiplayer Commander. It can help to fill your hand with lands to play and all the lands helps to keep it on the battlefield longer. Animist's Awakening: already playing Genesis Wave and Wave is a much better card. Khalni Heart Expedition: a fine card, but a one shot effect, there's better repeatable options. Tishana, Voice of Thunder: this kind of draw is fine, but you don't really need it. Skyshroud Ranger: can only use her ability at sorcery speed, makes her the least good creature with this effect. Rites of Flourishing: helps your opponents too much especially control players. Nissa, Steward of Elements: her -6 is powerful, but I think overall Vital Force gives you more.